Will your class escape in time? Try this escape style game with your students today! The superheroes protecting your city have been captured by some evil villains! You only have 45 to find them, before the villains take control of the city. Your students must act fast to save the heroes. 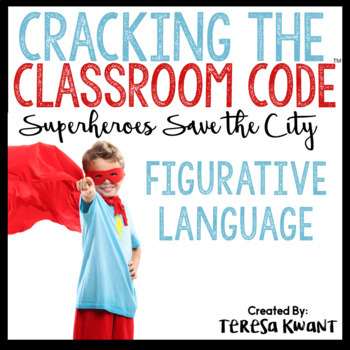 Students must solve a string of ELA questions and clues based on figurative language to escape this risky situation. If your class has never played an escape style game before, I suggest playing this as a whole class. However, materials are provided for up to 6 different groups to play at one time. This is an interactive game where the students are timed. Students try and solve clues and literacy questions to breakout and escape the classroom.You, the teacher, can decide how much time your students have to complete the task. I suggest 45 minutes, but it is up to your discretion. You can project a timer for your class, or put one somewhere for all the students to see, so they can keep track of how much time they have left to complete their task.